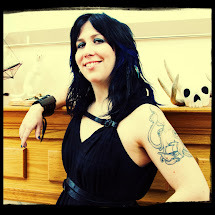 The Crooked Art of Lana Crooks: Long time no see! Ahhh...this promises to be a disjointed posting. Oh excellent news! I have just finished my pieces for Gallery 1988 in San Francisco! They are in their boxes and awaiting shipment. 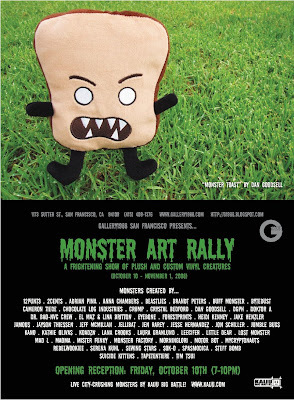 The Gallery will have 6 of my pieces up for the Monster Art Rally. One of my newest pieces being shipped off for the event. 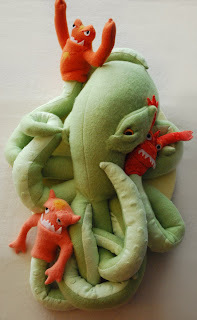 I also made a couple of polite monsters. I will post photos of them after the opening. Been very busy planning, plotting, and sewing lately. Currently I am working on a piece for my solo show, a surly pirate named Barnacle Bill. I also have finally made a schedule as to insure all the new work I want done for the show actually gets done. This will either be a triumph of organization or a depressing badge of procrastination. I hope for the former. There is a terrible amount of rain today which means I have no excuse but to work...hence why I am on the computer while shaking my fist at the sewing machine. Ok,Ok, I'll work...sheeeeesh!